We provide window cleaning services in the greater Atlanta area. We believe providing the best window cleaning service possible is simply good window cleaning business. We know that the Atlanta area has a variety of window cleaning service providers to choose from, and we take every measure possible to provide safety first, high quality, affordable window cleaning service. Our window cleaning service company has been around for almost two decades. This successful track record has afforded us many great window cleaning service references and a number of intricate jobs requiring difficult rigging. 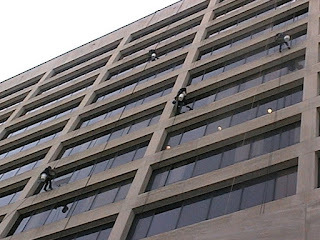 High rise window cleaning service should be measured on cleaning every window and the frames. Most property managers measure window cleaning service by the price. Unfortunately most window cleaning service contractors also measure window cleaning service by the price, and not by providing a detailed window cleaning service. We feel that it is important to throughly clean the windows and the frames during window cleaning service, not just quickly wipe over the window with a window cleaning brush and squeegee.